This was the last layer painted, the black. Look at this mess of tape. I was just praying at this point when I painted it black that it came out resembling something usable. I love your's though Brett. It looks fantastic. Yeah....I’m out! If I attempted this paint job, I’d lose patience in the 1st 3 minutes and totally have tape placement wrong all over the place! Way to many shapes and layers to get perfect. I’d go crazy! I do have a question tho. What are the color applications? What’s color goes on 1st all the way thru to the last color? Last edited by Hurricane Halen; 02.08.19 at 05:03 AM. Copyright holder of all things, "<-----------------"
I'm stressed just looking at that pic. Seems totally legit to me. I remember going into a Guitar Center in the early 90s and seeing a Bumblebee hanging on the wall. I didnt think much of it at the time but looking back I'm curious as to where it came from and what it was because this was obviously well before Ed started his official releases. It could've been one of those early Charvels like that video. Joe Bonamassa has one too. I really took my time in terms of stepping away from it when it got frustrating. That helped. So you paint it yellow first. 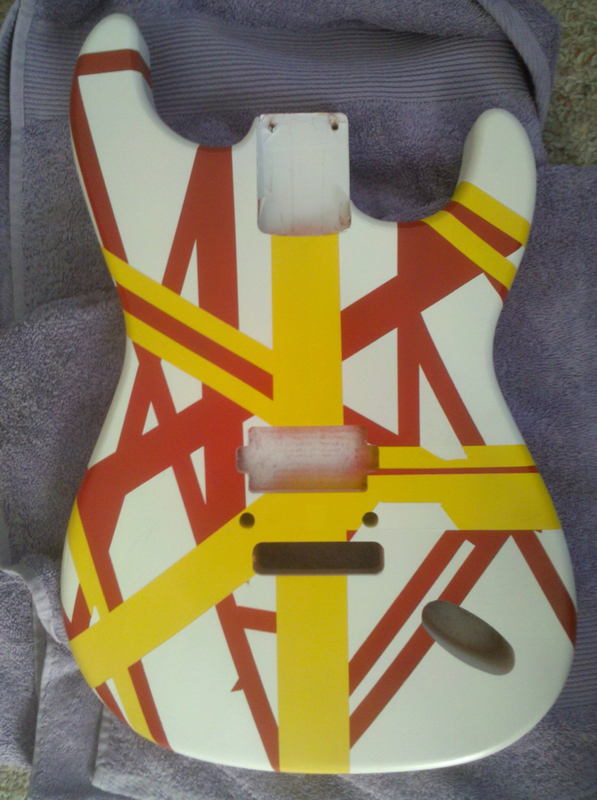 Tape off all the yellow stripes, then paint it red. Then you tape off the red stripes and paint it white. Then you remove all the tape. Then you reverse it mask it for the green areas, and paint it green. 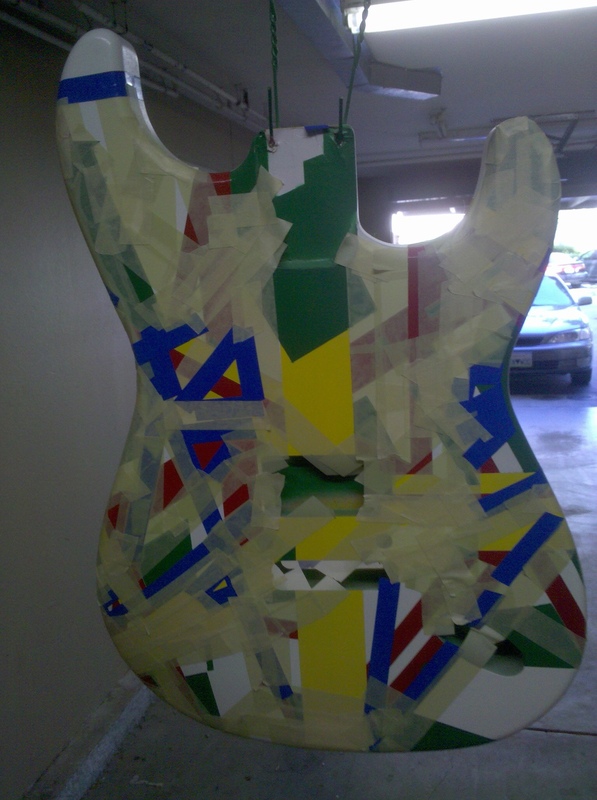 Then take all the tape off again, and reverse mask it for the black like in my picture and paint it black. And you’re done! I think you're probably right. I know it was when I was first getting into guitar and my dad saw the price tag and said no. It's funny because at that point I had no idea Ed built his own guitars. I thought I could just go into a store and by a 5150 Kramer, and especially after seeing that bee I figured they were just out of stock. LOL. My dad bought me an Ibanez and I pissed him off by writing 5150 under the bridge with a sharpie not long after I got it home. Then I read the Jas Obrecht articles with Ed where he was talking about building his own guitars so i started taking mine apart and messing around with it and that really pissed my dad off. 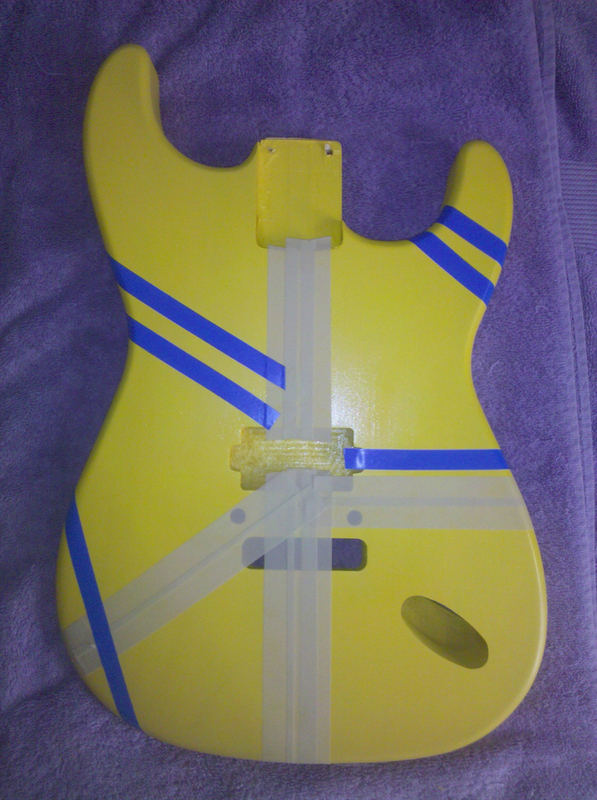 I ended up getting my EBMM not much later and sanded down the Ibanez and striped it up - it was blue and gold. I don't know what became of it, but I still have the neck which is on my blue and white striped Strat thatvi built a long time ago. 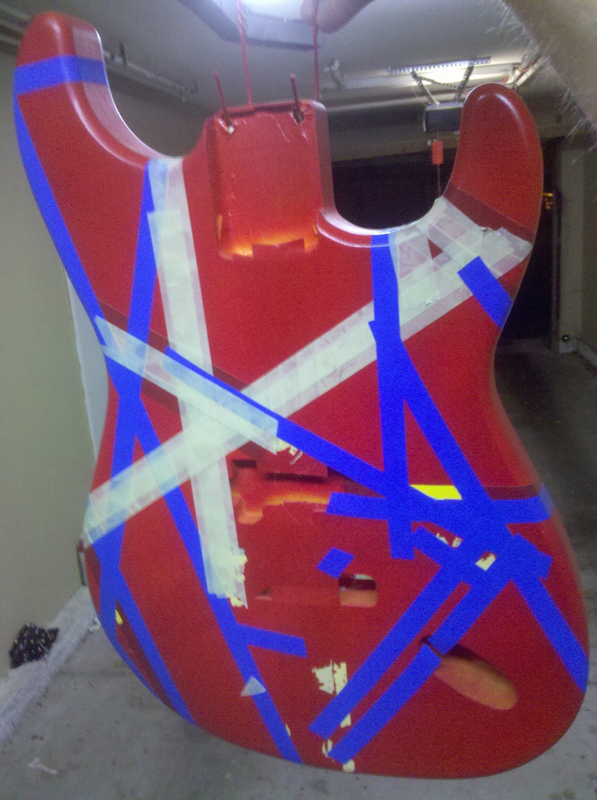 Seeing Brett's tape pics gave me a chuckle because I didnt even have the patience with Strat to do the stripes right, I just threw tape on it and sprayed it up. I have even less patience.. 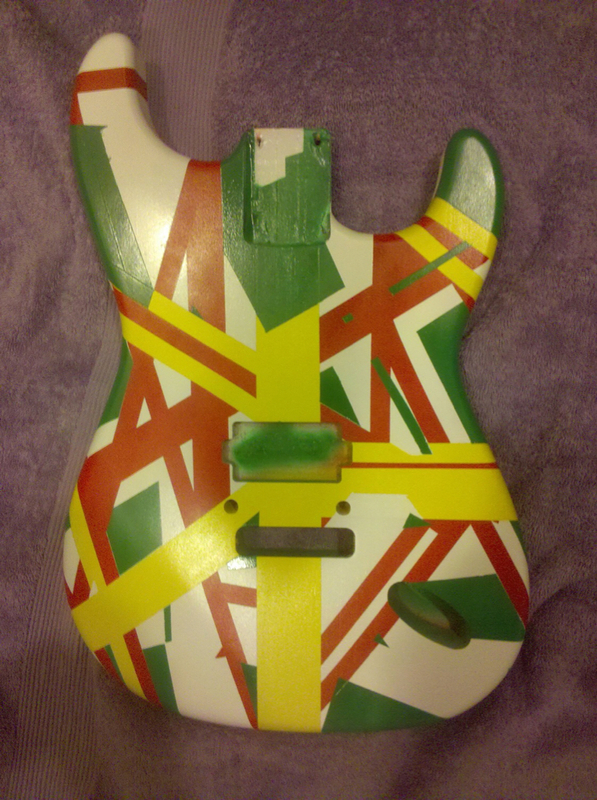 I just used electrical tape when I wanted a guitar to have stripes. Lol didn't look too bad on a black Steinberger back in the day. How does that Strat sound and play? You should do one of your vids with it sometime. Ha! I was going to. Then I went and plugged it in and it started making this obnoxious feedback sound so I tried to turn the volume down and noticed that the entire pot was turning. So I took the back plate off and discovered that the wiring was all jacked up and wrapped around the pot. So I'm going to have to replace it. It plays decent and sounds pretty good for the most part. There's one problem with it and that is that the intonation is slightly off because when I put the Floyd Rose on I didnt know what I was doing and it's slightly off center. It's not really noticeable unless you play barre chords real high up the neck. I was like 19 when I built that thing. Lol. Maybe I missed it as I didn't see a link to part two of this youtube clip or read it here in this thread, but does anyone know how Dweezil acquired this guitar? A gift from Ed, perhaps? Anyone know the story? "People say Cream gave birth to Heavy Metal," says Baker. "If that's so, we should have had an abortion." I'm fairly certain that Ed gave it to him. There's a story of Frank calling up Ed to come over to the house and play on a record that young Dweezil was recording, so Ed showed up in his WACF jumpsuit and brought a guitar. Not sure if it was the Rasta but maybe it was then? EDIT: Doesn't mention if he gave him the Rasta but a cool read anyway. Last edited by Get The Show On The Road; 02.08.19 at 02:54 PM. Ed gave it to him. Dweezil saw it sitting in a corner without a neck and Ed offered it to him because he didn’t like it, it was too heavy. Wow....Is it safe to assume that one reason this particular guitar has such sweet tone is in fact because it is heavy? Besides the pups, choice of amp, set-up, individual players hands, shape of the body, etc..wouldn't the type and amount of wood in the body determine the tone? Albeit to a lesser degree than the aforementioned factors? There's so many factors that go into how a guitar's body wood affects tone. Mass, density, species, etc. There are variances between identically spec'd pieces of the same species. You could have a 10lb ash body that sounds like crap and a 4lb basswood body that sounds phenomenal, or vice versa. It's all kinda a crap shoot. 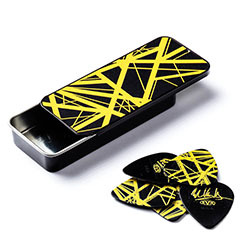 There are generalities that help you narrow down the species you should choose for your guitar, but even then there is a decently wide range of what it could sound like. That guitar was specifically constructed to be thicker to offset some of the thinness in tone the prototype Floyds had, but it may not have made much a difference, hence its limited use. The long story short of what I'm saying is that it's not likely that the body's extra thickness and thus extra weight contributed greatly to the tone. If the tone of that guitar was that much better then Eddie would've continued to commission and design guitars with thicker bodies. Instead he threw it in a corner and gave it away to a kid. 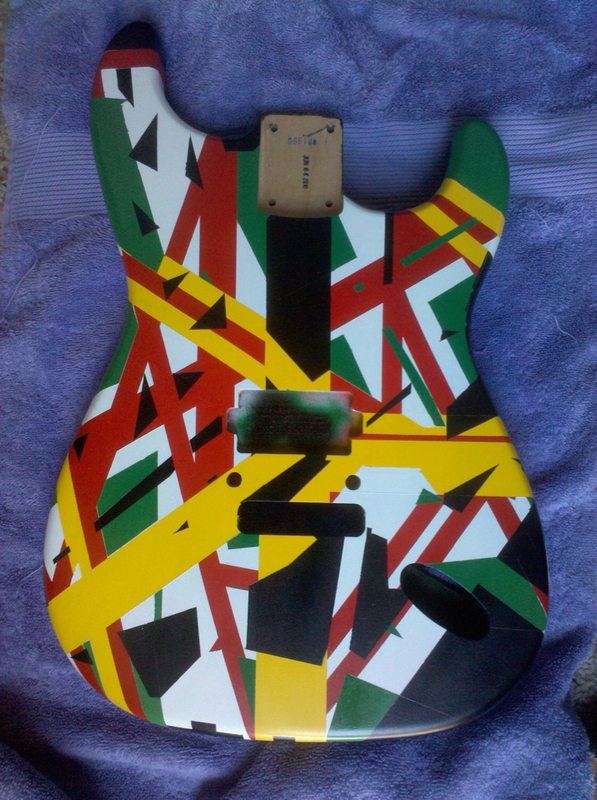 Dweezil Zappa has the Rasta/Unchained Circles guitar? That review is pretty well stated as well. Let's close this thing out tonight Avs!